← The cycle of high mineral prices are over, analysts say … what will the ruling demagogues say now?! In most parts of the world, cable cars are relegated to ski areas or amusement parks. 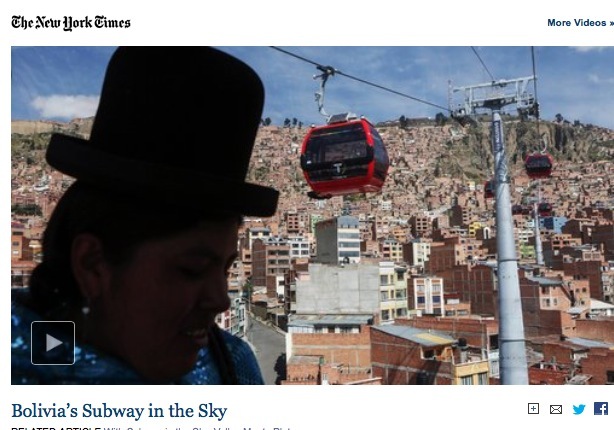 But in South America, cities use the gondolas to navigate undulating terrain as public transportation. This fall, two more lines will open in Bolivia’s La Paz-El Alto network, making it the longest urban cable car system in the world. The potential for this new method of transportation to transform cities like La Paz is huge, where the city is built on veritable alpine cliffs 12,000 feet above sea level. Cable cars provide a light touch on city infrastructure, and can connect steep neighborhoods where trains are too impractical or expensive. It’s also cleaner and safer than the other alternative—the addition of more crowded minibuses, which will only lead to more streets choked with traffic and pollution. This entry was posted in Bolivia, La Paz, Tourism, Uncategorized and tagged innovation. Bookmark the permalink.